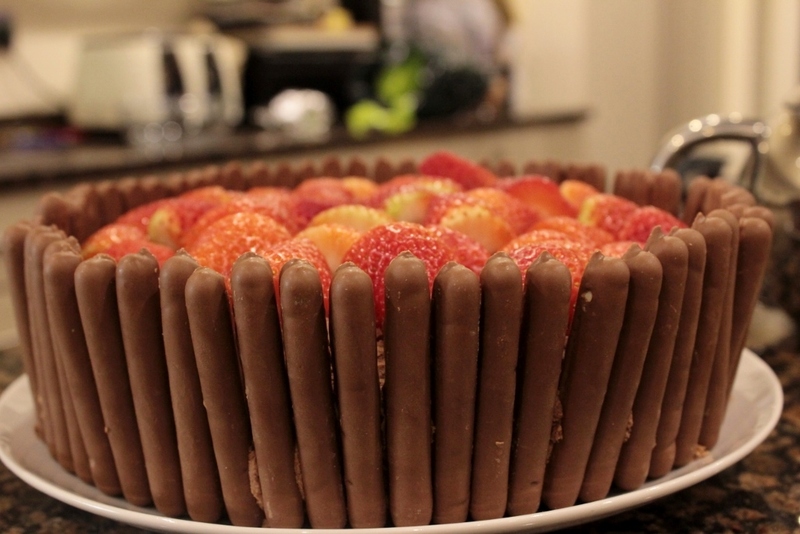 Last Monday was the second Cladenstine Cake Club of the year and as February was the month of Valentine’s day, the theme of the night was Pure Romance. 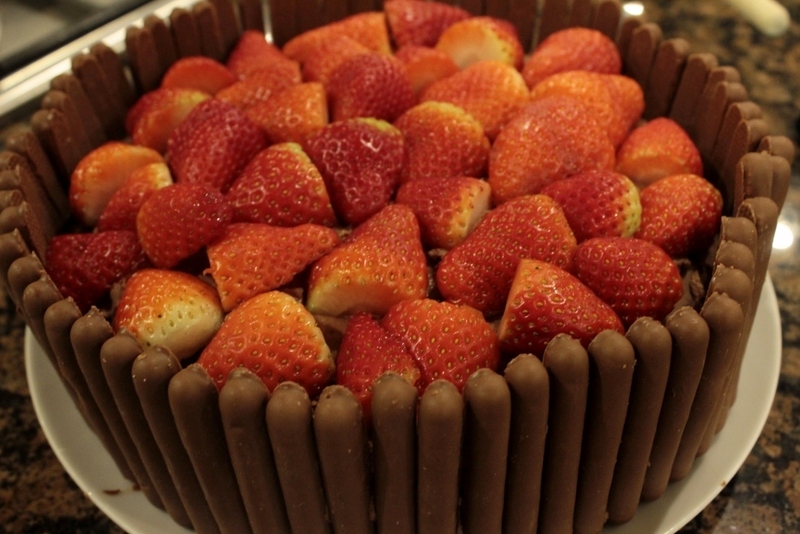 I was super excited as with pure romance being the theme, surely there must be must be some chocolate cake and also it gave me a chance to try out a cake I had never made before. 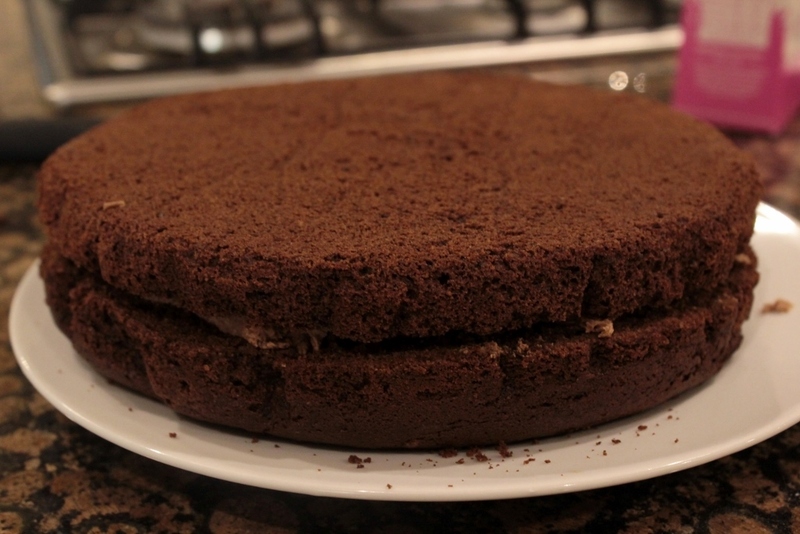 A few took my fancy, from a passion cake recipe by Sarah Cook to a chocolate and coconut layer cake but as soon as I saw the ‘I can’t believe you made that cake’ by Lorraine Pascale, I knew I had to give it a go. 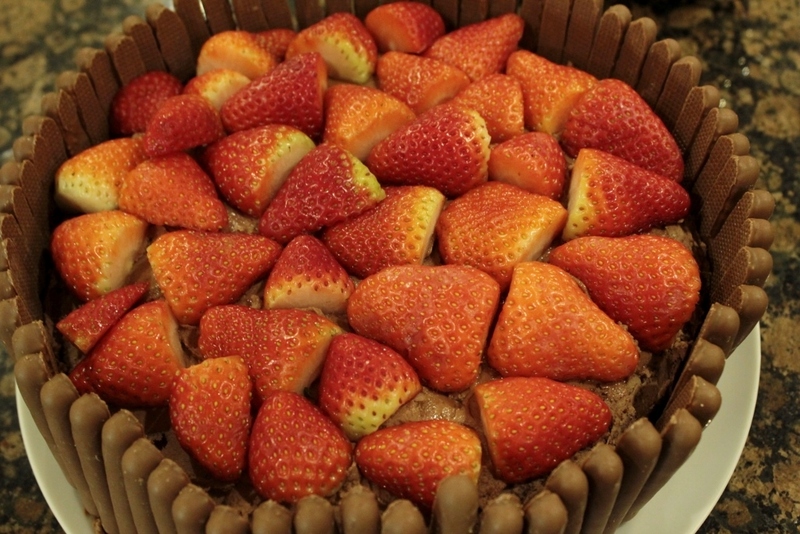 A two layered chocolate buttercream cake with raspberries or strawberries on top and lots of chocolate cigarillios round the outside, it looked beautiful. 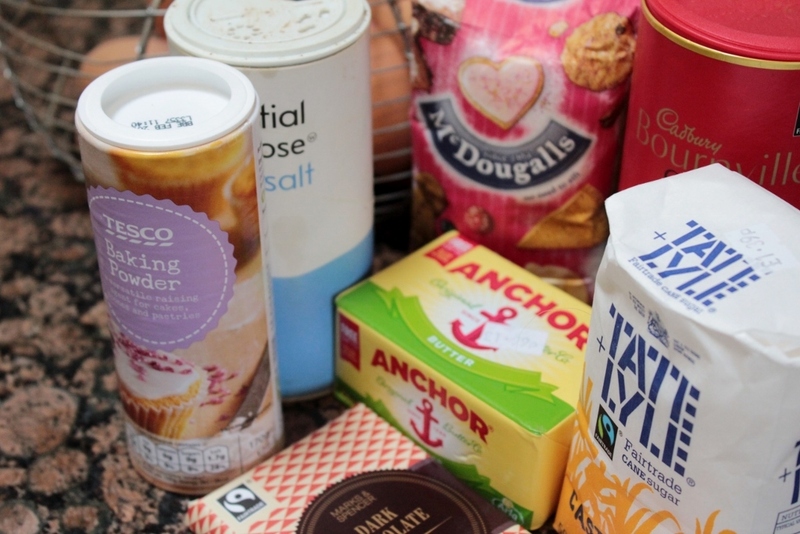 Preheat the oven to 180/C/350F/Gas 4 and line a 20cm/8in round deep cake tin with baking paper and brush or spray with oil. 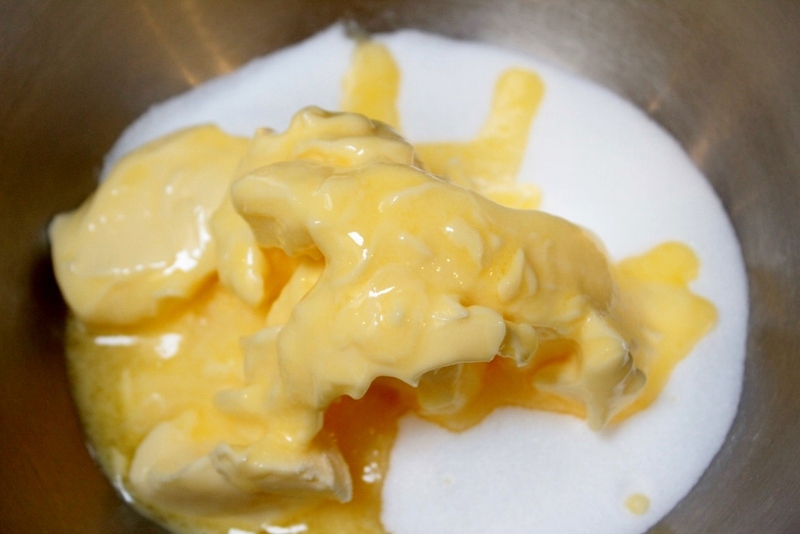 Cream together the butter and sugar in a large bowl until they begin to go pale. Add half of the eggs and half of the flour and mix well. 3. 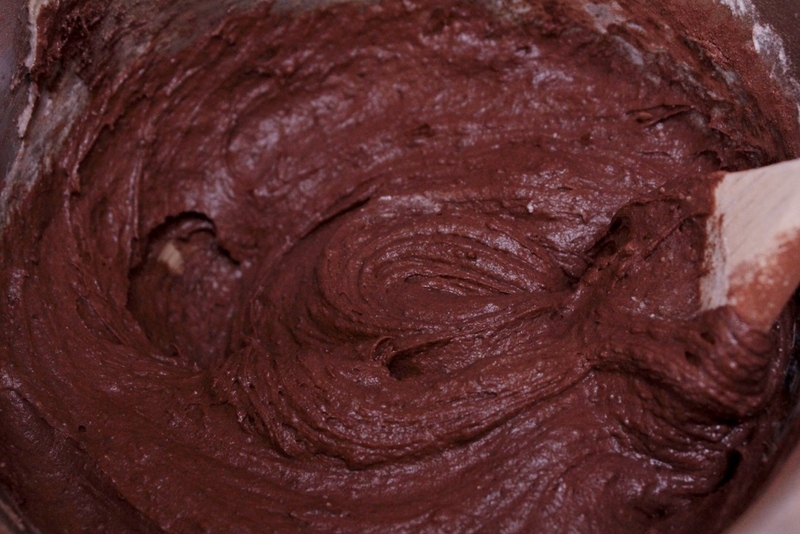 Add the rest of the eggs, flour, cocoa powder, salt and baking powder and beat for a minute or two until the mixture is all one colour. 4.Dollop into the prepared tin and bake in the oven for about 30–40 minutes, or until a skewer inserted in the middle comes out clean. Leave to cool in the tin. 5. 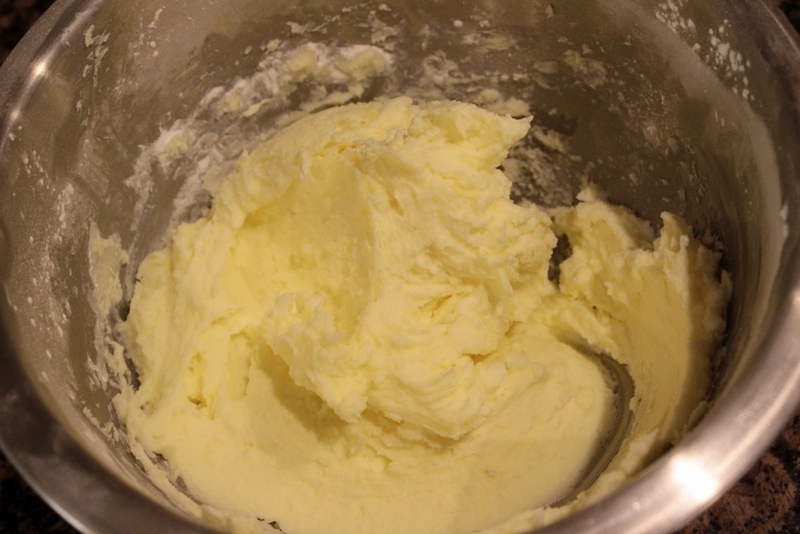 Meanwhile, make the buttercream: put the butter and icing sugar in a bowl and whisk together until the mixture goes fluffy. 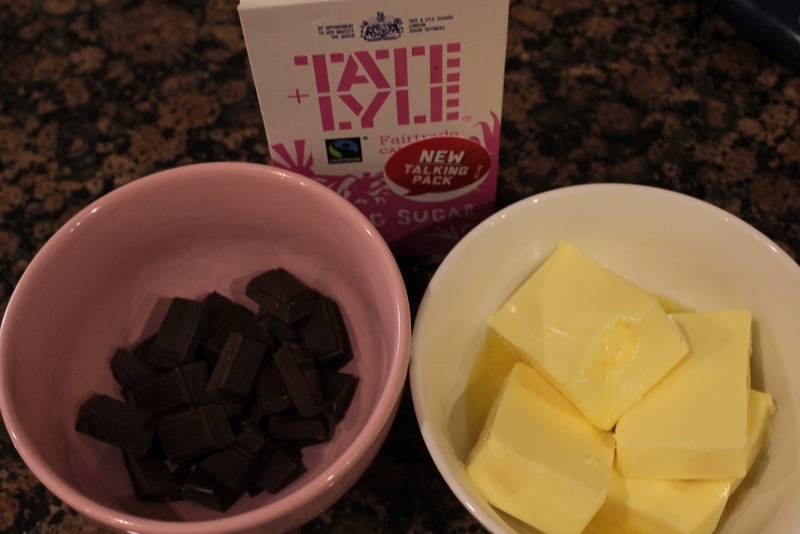 Add the cooled, melted chocolate and whisk for a further two minutes. 7. 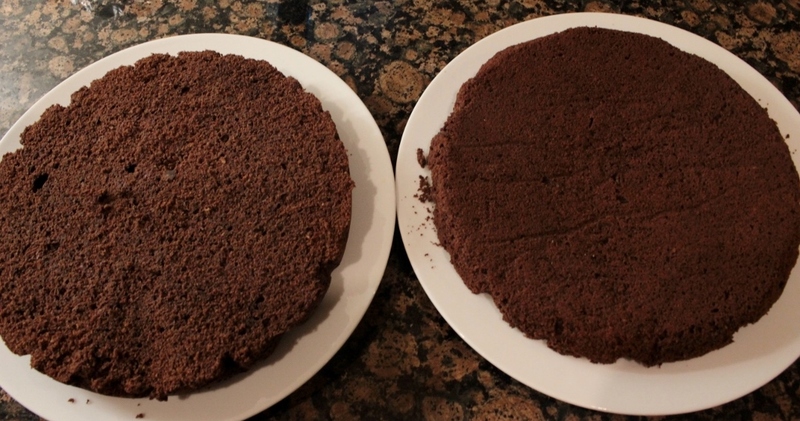 Turn the cake upside down on a 20cm/8in cake board so that the bottom now becomes a nice flat top. 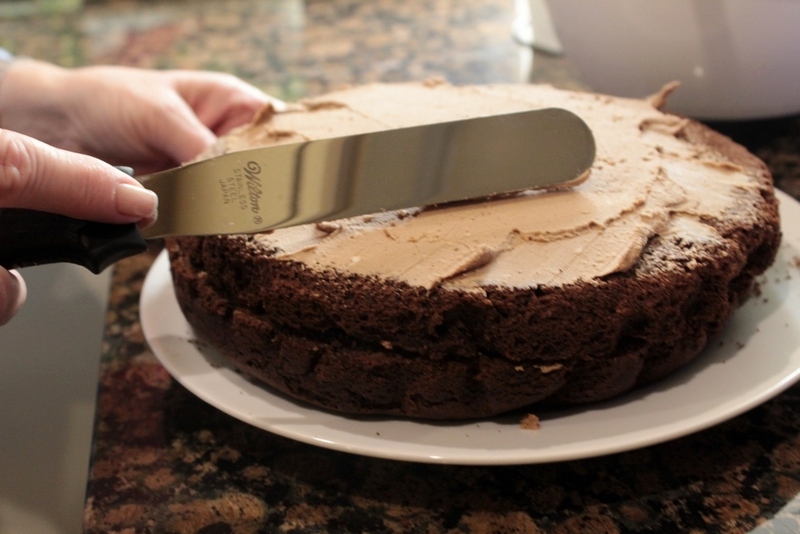 Split the cake horizontally and sandwich the top and bottom together with a 1cm/½in layer of buttercream. 8. 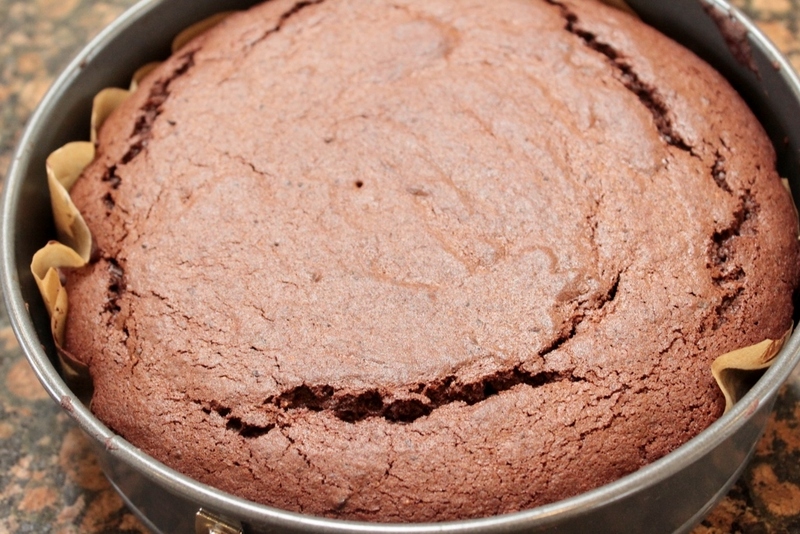 Spread half of the remaining buttercream all over the top and sides of the cake, making it as smooth as possible. 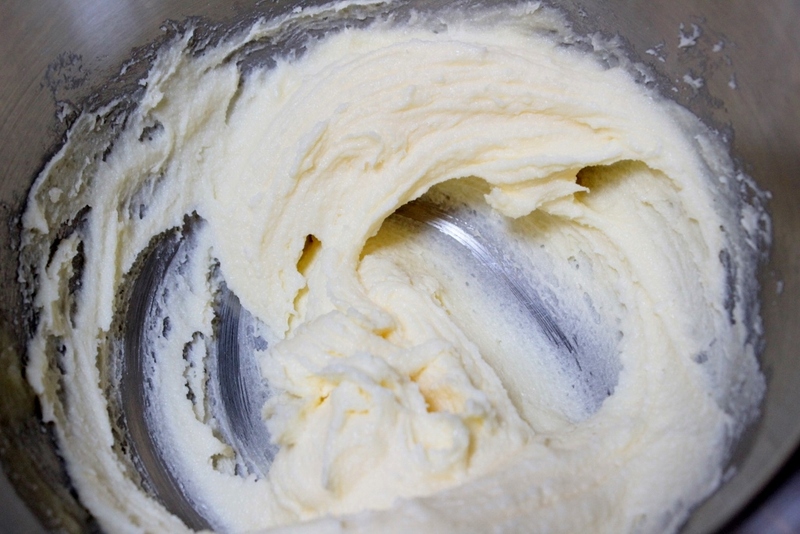 Put it in the fridge to set before doing another layer – this makes it much easier to get neat squared-off edges. 9. 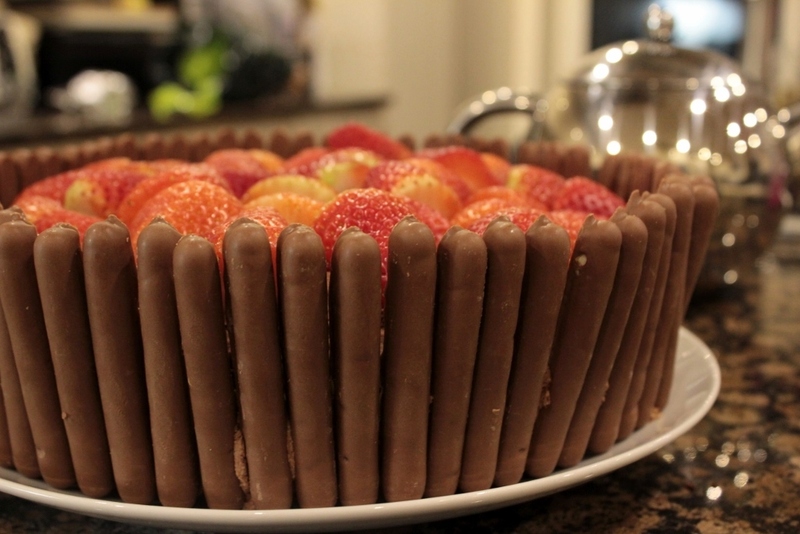 Gently push the cigarillos/chocolate fingers vertically onto the sides of the cake, positioning them as straight as possible and making sure they touch the bottom. I had a near disaster as I had bought 3 packets of chocolate fingers but somehow managed to eat a whole box whilst making the cake so actually ended up a finger short. Don’t look too closely at the pictures because you’ll see the gap! 10. 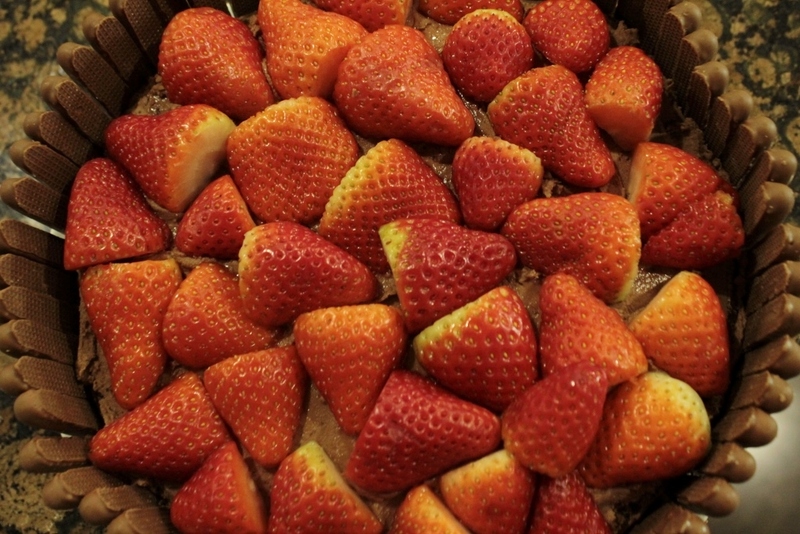 Finish by scattering strawberries and raspberries on top and voila! Despite the drama with the fingers I was really pleased with how the cake turned out and just hoped it would make it in one piece to the event. 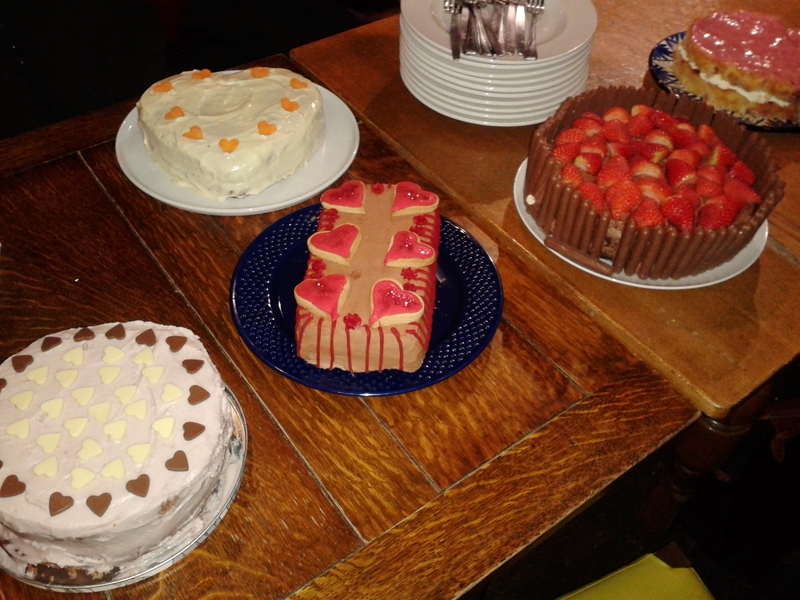 Last Monday it was held at the lovely Abbey Tavern pub and when I arrived there was already a lovely selection of cakes laid out on the table. From heart shaped cakes to cakes with hearts hidden inside, red velvet and a raspberry baked cheescake I could not wait to dig in. It really is such a lovely evening, a chance to meet new people and talk about all sorts, not only food (although baking and amazing places to eat cropped up several times). 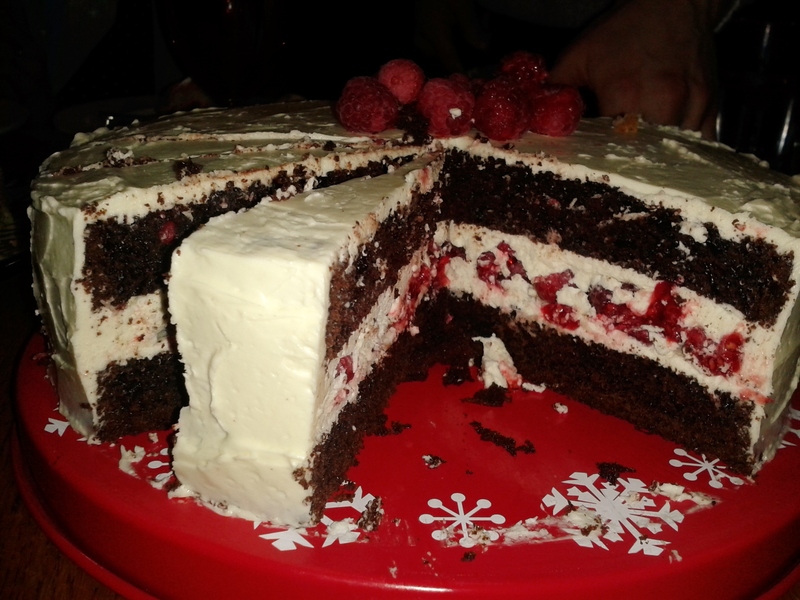 Jess made an incredible raspberry and chocolate cake with swiss meringue buttercream as a test for her friends wedding. It looked beautiful inside and everyone couldn’t help but have a second piece. Deb’s raspberry cream cake was light and fruity and Lynn made a ‘passion cake’ which was actually a twist on the traditional carrot cake. There was also purple velvet cake, red velvet cake, banana and chocolate cake and Jelena’s ‘heart desire’ cake which had some delicious glittery heart shaped biscuits on it. We all ate lots of cake pretty fast and then sat back and felt full to the brim. 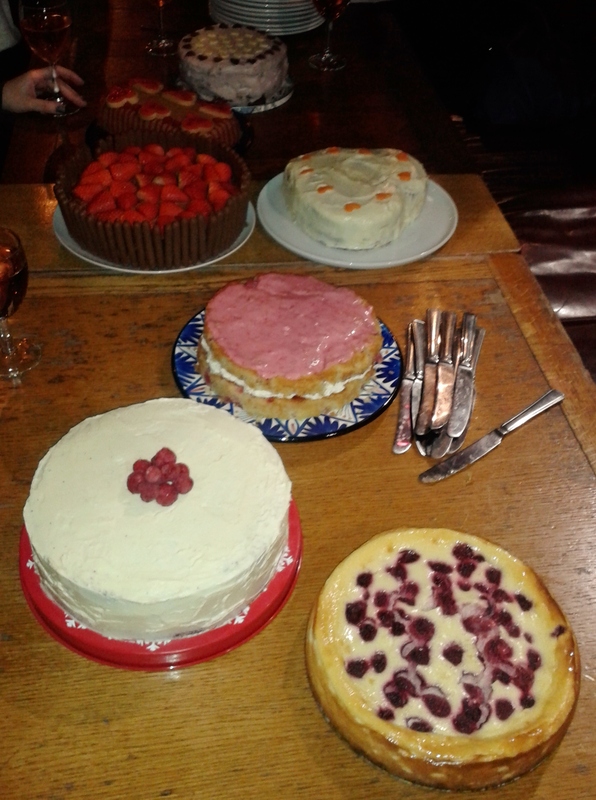 I still managed to take a slice of each cake home with me to share at work but also to save some for Tuesday! Love your post Fiona. 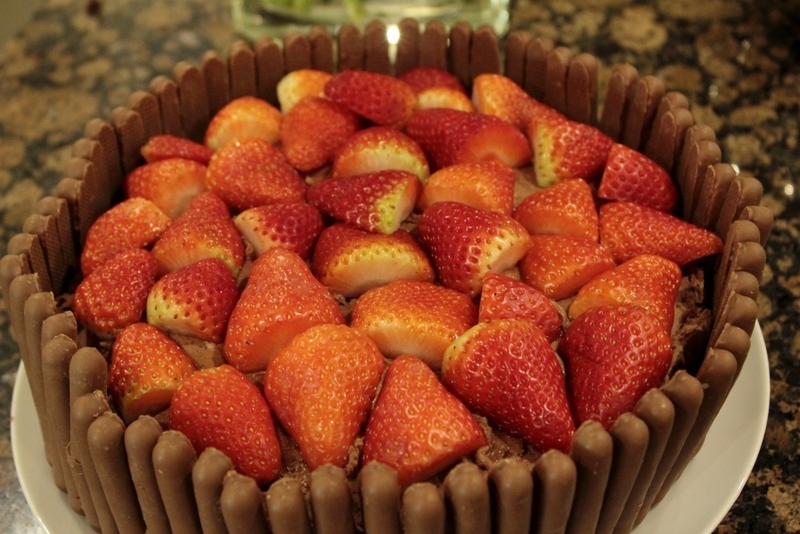 Excellent cake. I am looking forward to try some of your other cakes.